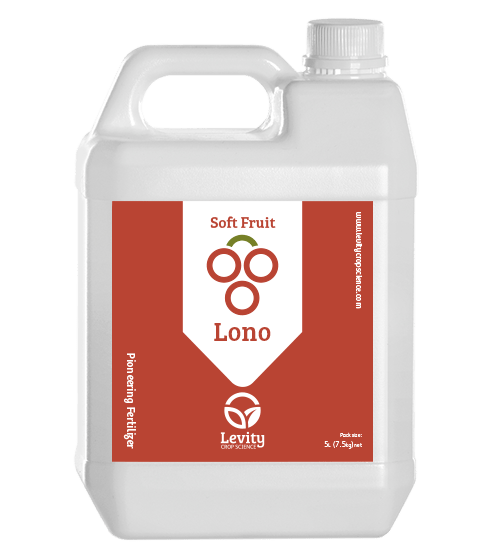 Lono for Soft Fruit is a smart fertiliser that focuses the plants growth on reproductive growth (flowers and fruit), by supplying nitrogen in a form that encourages reproductive growth rather than the vegetative growth stimulated by conventional N fertilisers. Lono uses Levity’s LimiN chemistry to hold nitrogen in the amine form, and also contains calcium, applied in low doses through the season Lono increases flowering, and fruit growth, lifting both number and size of fruit. Lono helps crops maintain growth during periods of stress, safeguarding yield. Application Rate: General application rate 5 l/ha through drip irrigation at 14 day intervals through growing season. Transplanting 2 l/ha through drip irrigation at transplanting to better establish plants.